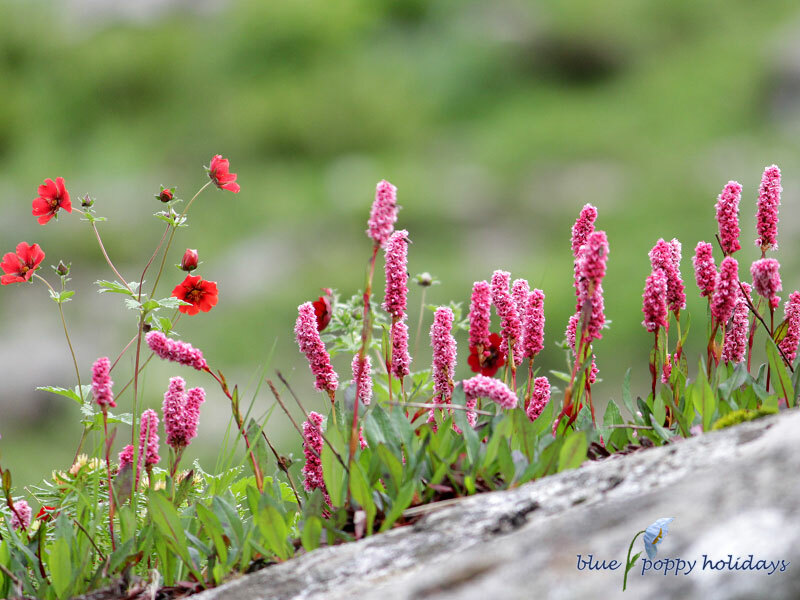 Valley of Flowers National Park is an outstandingly beautiful high-altitude Himalayan valley that has been acknowledged as such by renowned mountaineers and botanists in literature for over a century and in Hindu Mythology for much longer. Valley was declared a national park in 1982, and now it is a World Heritage Site. 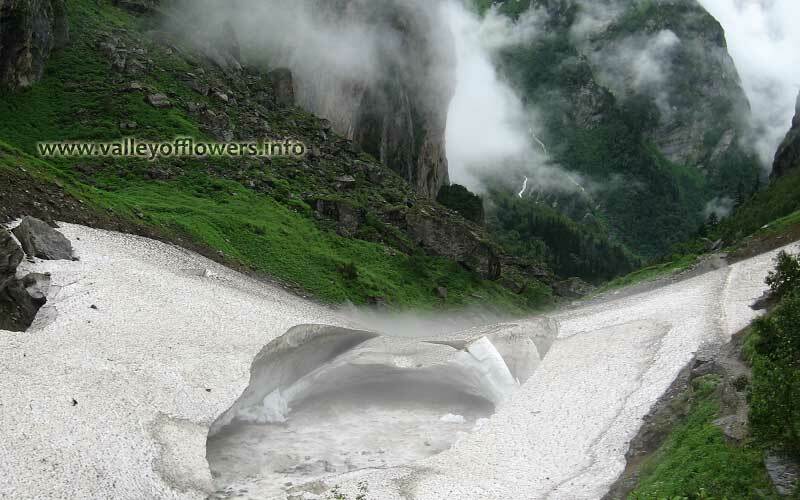 While trekking towards Valley of flowers, one can experience the beauty of shining peaks fully covered with snow. One can also see the beautiful view of surrounding greenery and various running streams with crystal clear water. The valley is home to many celebrated flowers like the BrahmaKamal, The Blue Poppy and the Cobra Lilly. It is a much sought after haunt for flower-lovers, botanists and of course trekkers. Apart from the flowering plants, wild animals like Himalayan birds, butterflies, Tendula, tail less rat, Musk deer, phigents, Himalayan bear etc. are enchanting the beauty too. 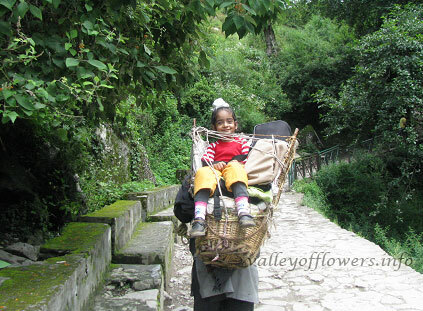 The Valley of Flowers is an irresistible treat for zoologists, environmentalists, pilgrims. 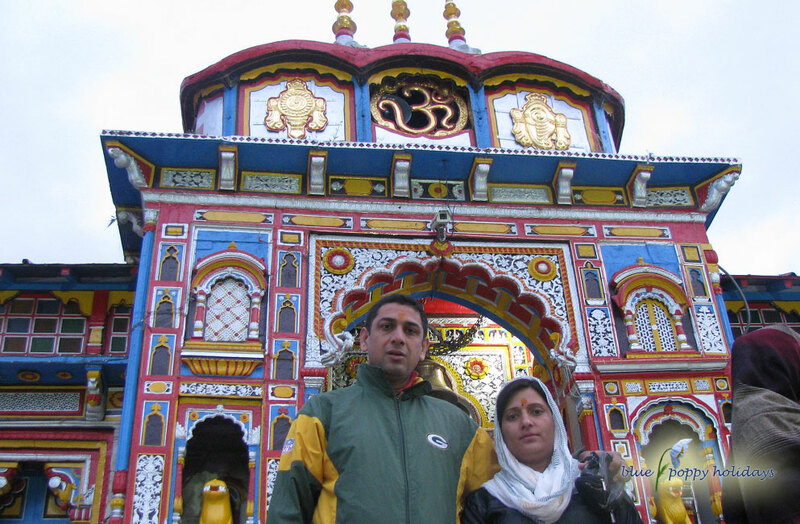 Village Ghangaria is the base camp for trek to Valley of Flowers and Hemkund Sahib. 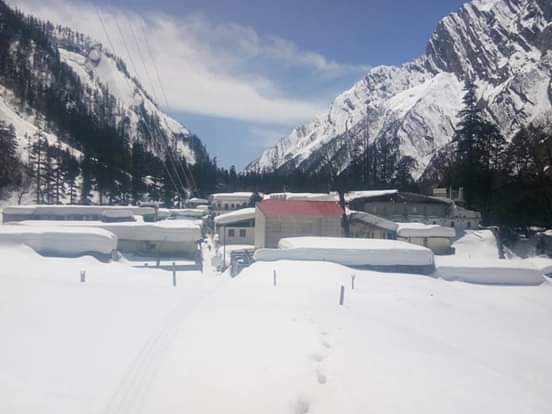 Since camping and overnight stay Is not allowed in the Valley of Flowers, Ghangaria is the logical base camp for the trek. Travel beyond Ghangaria is on foot at Nature’s place since the entry of ponies is prohibited. 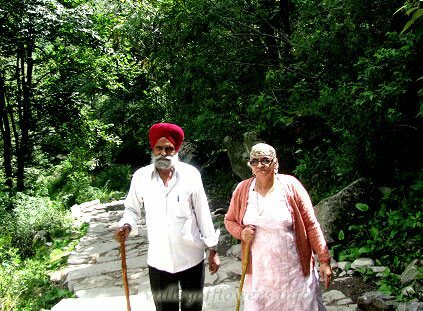 The trek is subject to strict ecological discipline and the trekker is expected to be concerned about the ecosystem of the region. After staying overnight at Ghangaria the next day trek to valley of flowers is started early in the morning. After crossing a log or iron bridge (This bridge breaks every season due to glacier) over the Laxman Ganga, 300 mts. from Ghangaria. 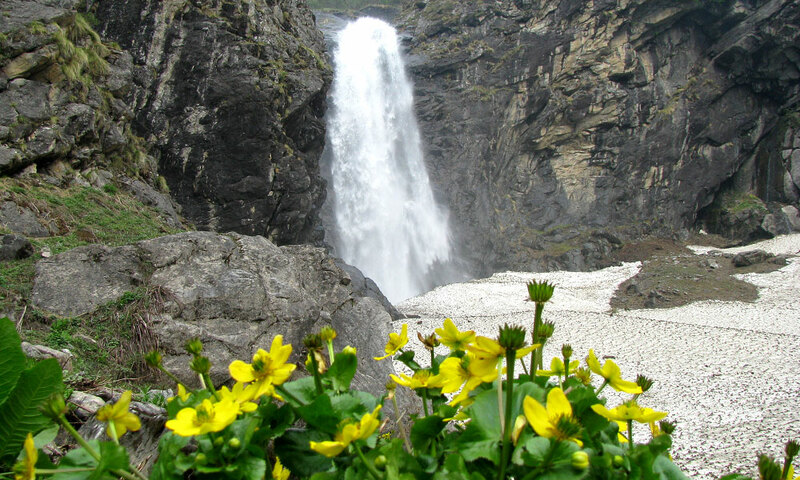 the route of the Valley of Flowers separates from that going to Hemkund Sahib. Waterfall in front of Valley of Flowers entry gate. You should try to visit this waterfall on the evening you reach Ghangaria. Generally people from all over the world coming to Valley of Flowers need to first reach Haridwar. Haridwar is situated 200 kilometers from New Delhi in the state of Uttrakhand (India). On day one from Haridwar you need to travel by road for almost 10-12 hours and reach Govindghat. The mode of transport available is only by road. Things to be taken care of: Do not take your own vehicle for the trip as you may get stuck on the way and you cannot leave your vehicle and move on. The next day (day 2) you need to reach Ghangaria, the base camp to visit Valley of Flowers. You are having four options from Govindgaht to Ghangaria viz. Trek, Pony, Porter (They can carry you on their back in a basket if you weigh up to 50-60 kilograms) and Helicopter. You can use any of them. If you are not a professional trekker, We recommend you to conserve your energy for the next day. As next day you will be going to Valley of flowers. 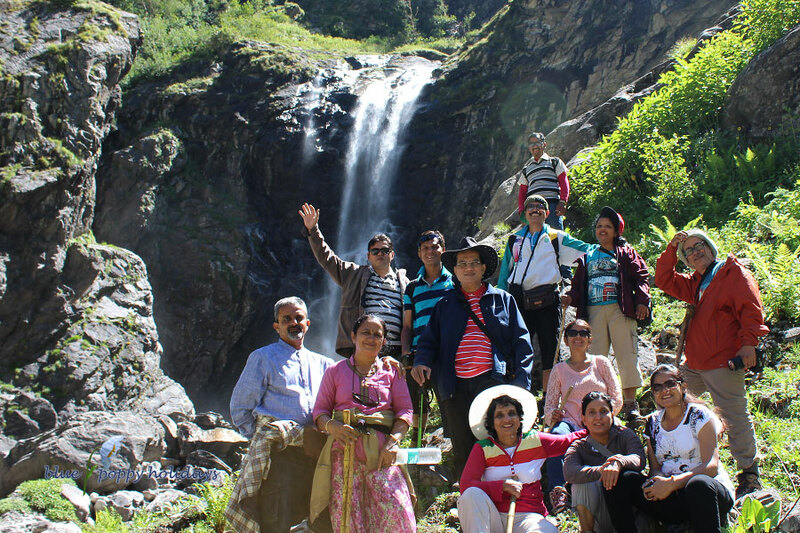 For full detailed tour program for trip, kindly visit our Valley of flowers trek page. Here detailed itinerary is given. The next day (day 3) you will be going to Valley of Flowers. Here you need to trek on your own and no pony or helicopter service is available. 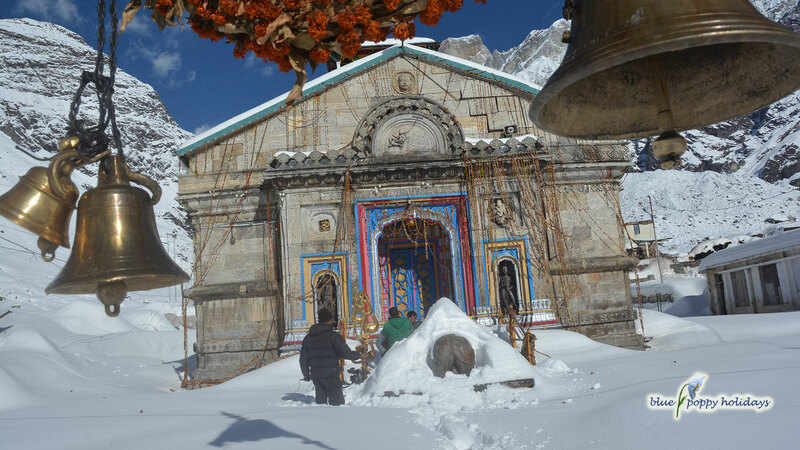 Although, if you are not physically fit for trek you may hire porter/porters. Generally four porters can carry one person. Overnight stay is not allowed in Valley of Flowers, you need to be back by five in the evening and the Valley of Flowers opens at seven in the morning. Do not waste time in clicking photographs too much as should reach at least up to Pushpawati River bed. And that point is seven kilometers from the entry gate of Valley of flowers. Means you need to trek for 14 kilometers in total. We recommend you to have one extra day for Valley of Flowers as many times it rains and you require an extra day to have a good view of Valley of Flowers. 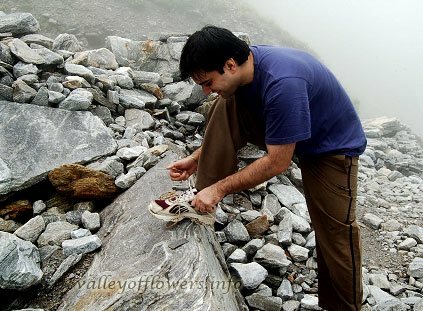 To know more about packages of this year, please check our valley of flowers trekking packages page. I will be coming to Rishikesh on 30th July & plan to spend 2 days there. 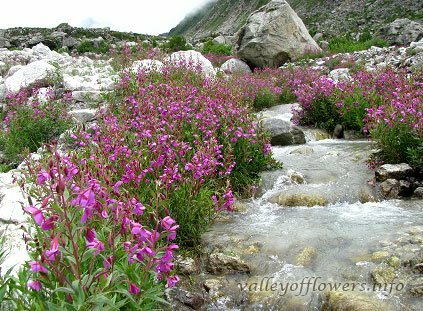 Is it possible for me to take a valley of flowers tour from Aug 1 to say Aug 6? I’m Dr Shaunak Shah, 55/M, from Ahmedabad & I am solo. A detailed itinerary has been sent to you please go through it or you can call us on 9991242759. I am a senior citizen of 60. I want to visit valley of flowers with my daughters aged 27. Pl. send the details of the next year trip n cost. A detailed itinerary has been sent to you. Please check and revert. We want to come for camp & tracking in Aug 11 to 16 with 16 people, please share amount and all information. Hi, A detailed itinerary has been sent to you. I am interested in this trip, kindly mail me the itenary with the total cost for next year. A detailed itinerary has been sen to you. We are intrested in visiting VOF in the month of October end do you suggest so?? or we can plan next year also. Also kindly let us know cost of the package we are Two adults and two children(10 and 7). Instead of going for October end you can plan it for next year as by October end Valley of Flowers will be closed. I would like to visit the valley of flowers during the last wk of june/first wk of july, I'm from bangalore.do i need to join only from Haridwar or is anyone going from Bangalore too. What type of accomodattion would be provided at govindghat and ghangaria? A detailed mail has been sent to you for itinerary and costing. Many people are coming with us who are from Bangalore. For more details regarding that kindly call us on +919991142759. Accomodation will be given in Hotels only in Govindghat and Ghangaria. A detailed mail has been sent to you with itinerary and costing. Yes it will be raining from mid of july up to mid of august in Valley of Flowers.